BE pressure washer models reviewed in this article represent a wide range of top pressure washers by BE. The company manufactures several types of washers namely belt drive, industrial belt drive, electric powered washers, gas powered washers, and truck mounted pressure washers for commercial use. In terms of water pressure BE washers range from those for household use 1100 psi to as high as 4000 psi suitable for heavy duty commercial industrial use. 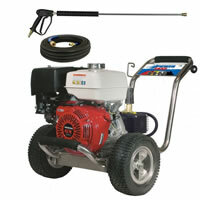 BE pressure washers are gas powered as well as electric powered. Overall BE washers enjoy a good reputation and high consumer ratings. This is BE pressure washer model PE-2005HWX. As mentioned in the title it produces up to 2500 psi (pressure per square inch) at 2.3 GPM of water flow. If you run a light commercial establishment this pressure washer is probably for you. It will also manage to keep your estate and farm projects covered. It has just enough power to remove the mud and dirt associated with farm or estate production. The 10" tubed pneumatic tires are also designed for rough terrain which will be ideal for your outdoor projects. The general advice concerning pressure washers is that electric washers are suitable for use around the home in and outside. gas powered washers such as this one may not be suitable for use in enclosed places due to gas fumes and general safety in dealing with gas in a home environment. However, you my still use gase powered washers, and many do out side and around the yard such as on your driveway, grill, deck and so on. Gas washers generally have a higher sound level many of them noisy and this makes them undesirable for neighbourhood use. This particular gas powered washer in review here is considered quiet and runs on a reliable Honda 5.0 HP GC 160 engine. This means the engine has 5hp which is quite powerful apart from the fact that Honda has one of the best engines for power washers. Also remember that this power washer only releases cold water. There are other hot water power washers in the market. Other features to expect includes an accompaying 25 feet hose. Unlike other manufacturers such as Troy Bilt pressure washers that make plastic and rubber hoses which often easily kink, this one is steel wire braided therefore lasting longer difficult to kink and meant for heavy duty projects out in the field. We give this BE Prosumer pressure washer model PE-2005HWX high ratings and recommend it highly. This BE pressure washer model PE-1115EW1COMX is a typical home pressure washer judging by its 1100 psi and electric powered pump. Due to the fact that it does not use gas but relies on electric power this unit and other such electric powered units instead rely on an electric motor. This washer uses the industrial 1.5hp Baldor electric motor. This motor is connected to a single phase of 110 volts and draws 13.7amps of lectric power. This washer is suitable for use indoors and outdoors. It produces no hot water but only cold water at 2.0 GPM. This washer will do your car, ATV, grill, boat, patio, driveway and other around the home jobs. Some users of these washers have complained of low pressure at 1100psi. In other words that 1100psi did not do a good job for certain projects. A tip for anyone caught is a similar situation with any pressure washer model for that matter is to try attaching a turbo pressure washer nozzle. The benefits here is the compressing effect of the nozzle on the flow of water and agitating that water. This gives significant extra cleaning power that you need. Should this be too much out of your way try the BE Professional 1500 PSI in the next review. In terms of nozzles this washer has 4 quick-connect nozzles of 0 degrees, 40 degrees and a soap nozzle. It is also accompanied by a 5000psi capacity rear entry spray gun. One important benefit to note here about rear entry spray guns is that your hose does not distract your movements. This may look insignificant but is important as it may slow your pace in doing your projects as you have to constantly deal with this obstruction. This is a nice home pressure washer whose power cord is 23 foot long and has the GFCI standard with double insulation for extra safety in the context of electrical shock. A good buy and also recommended for about the home light use. The $699.00 price tag is resonable for a product of its quality. Should you get into trouble with your pressure washer pump from this manufacturer or any other, you may try pump replacement from Comet pressure washer pumps. These are highly rated and often praised to be better than OEM pumps. The good part is that most BE washers already have Comet pumps. This is an equally quite pressure washer which impresses environmentally conscious users with its emission free cleaning both indoors and outdoors. This washer uses the reputable Comet Axial Pump model BXD2020E which is designed to be easy to mantain. Comet washer pumps reviewed here are disigned to be quick and easy replacement even in the field drastically reducing downtime. BE pressure washers have the welcome advantage of being built on a steel frame with rubber wheels. As in this case this makes for easy manuvouring around your work place. This model of BE washer will require that you part with up to $800.00 per unit. This price is somewhat on teh high side compared to $100.00 washers by Campbell Hausefeld. The only difference is the durability. This pressure washer by BE is built to last. $100.00 pressure washers will need replacement each and every year. Overall this is a good buy BE pressure washer. Durable, worth the price and competitive. You may consider reading our article on Buying Pressure Washer Tips. Selling for around $1400.00 this is a professional BE pressure washer which directly comes into the league of Northstar pressure washers reviewed elsewhere on this site. This is a competing choice you have between Northstar and this model both equally good. This washer is designed to do your jobs effectively and effecinently using cold water releases at 4000psi with a 4.0GPM flow. Caution has to be taken here because this is no household pressure washer. It is heavy duty industrial washer which will destroy many home type surfaces such as your garage, car windows, car paint, and even your driveway surface. This near monster machine runs on gas powering a 13 horse power Honda GX390 gas engine. It has a hose length of 50 feet which is clearly designed for industrial and commercial site use. This pressure washer typically strips walls of paint before a repainting job. 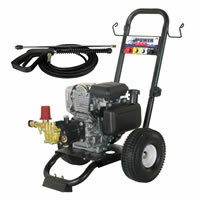 This is also a typical noisy pressure washer which is pushed about on a two wheel cart. In as much as the pressure is high from this washer it can be adjusted to suit your present needs and increased again to maximum 4000psi. As mentioned earlier this pressure washer is a good buy and competes with others of similar perfomance such as those from Northstar. In terms of look and feel this and other BE pressure washers in general are outdone by Northstar pressure washers. Troy Bilt pressure washers have a nice look but can hardly compete in quality with BE. Too many complaints and disappointments (in the midst of some happy experiences though) plugue Troy Bilt power washer machines. 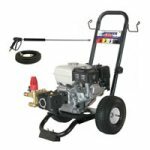 BE Prosumer 3600 PSI Pressure Washer - This is model PE-3713HWPCOME which uses gasoline and releases cold water under 3600 psi of pressure. This is considered a quiet pressure washer with a 50 feet long hose which is braided with wire designed to last longer than PVC hoses. 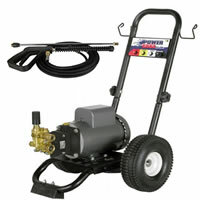 It goes well with pressure washer accessories such as the general pump quick-connect gutter cleaner. This is a $1000.00 pressure washet suitable for commercial heavy duty use. BE Professional 2000 PSI Pressure Washer - This BE pressure washer is model PE-2030EW1COM that will make you part with some $850.00 when bought on the internet. This is an electric washer releasing some high pressure cold water at 2000 psi. It runs on the respected Comet pump and has a continous duty motor. 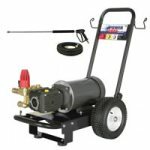 This pressure washer is suitable for home use and light commercial projects seeing that it runs on electricity and has only 2000psi at 2.2GPM. This is easily mobile washer on two rubber wheels only limited by the length of the electric cord.